Did you know that many of the foods we eat resemble the body part or organ they help? Here are a few examples of how food shapes influence your health. 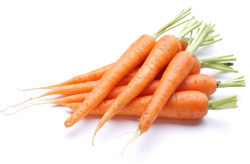 Carrots: The carotene in carrots helps protect and improve your eye sight, and when you look at a carrot that has been sliced, it looks like the human eye. Tomatoes: Just like your heart, a tomato has four internal chambers and tomatoes provide your heart with a vital nutrient called lycopine. Walnuts: Shelled walnuts look like a brain and contain the brain boosting food, Omega-3’s. Beans: Kidney beans look exactly like their body counterpart, the kidney and contain nutrients that help heal and maintain kidney function. Vegetables: Stalky veggies like celery, bok choy, and rhubarb resemble the body’s skeletal bones. These veggies specifically help strengthen bones. Sweet Potatoes: Sweet Potatoes are shaped like the pancreas and contain nutrients that help balance the glycemic index of diabetics. Onions: Onions look like cells in your body and research has shown that onions can help eliminate waste materials from all of the body cells.